The market for microcontrollers—the IC industry’s original system-on-chip (SoC) product category—is expected to continue hitting record-high annual revenues through 2022 after worldwide sales dropped 6% in 2016 because of a slowdown in MCU unit shipments. After drawing down MCU inventories in 2016, systems manufacturers stepped up purchases of microcontrollers in 2017 with unit shipments surging 22% and strong growth continuing in 2018. In its Mid-Year Update to The 2018 McClean Report, IC insights raised its projection for MCU shipments to 18% in 2018 with the unit volume reaching nearly 30.6 billion. 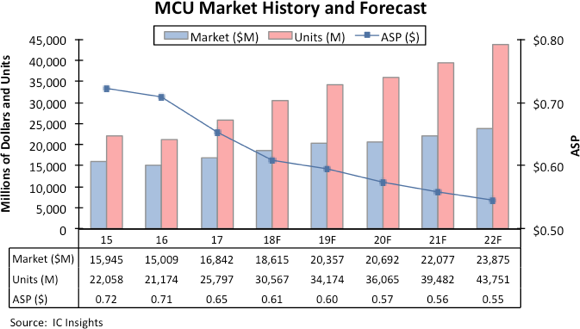 MCU revenues are now forecast to rise 11% in 2018 to an all-time high of $18.6 billion, followed by 9% growth in 2019 to about $20.4 billion (Figure 1).